MG-3000 automatic stretch blow molding machine is one of the newest products for our customer. Its strongest point is energy savings. Adopting high pressure clamping, MG-3000 automatic stretch blow molding machine makes self-adjustment in accordance with the different pressure needed during production, thus ensures the super clamping force. While the high pressure sealing system with automatic adjustment permits that mold sealing is under condition of 100% air tightness before blowing and avoid air energy loss owing to incomplete air tightness. With such effective control over air energy and power, it takes a big part to lower costs and improve efficiency. 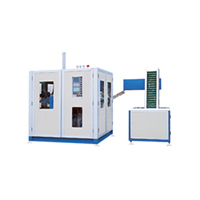 MG-3000 automatic stretch blow molding machine is widely used to produce varieties of PET plastic container and package for mineral water, beverage, oil, cosmetic and hot infusion, ect. Controlled by micro-computer with each main process fitted with safety of self-locking, it is operated by only one worker and the total production is completed automatically. Its wide utilization and reliable performance make it become popular and attractive to all bottle manufacturers. Built-in memory of PLC holds numbers of bottle blowing data.